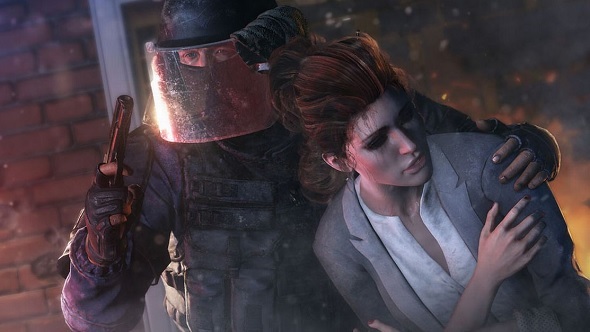 Rainbow Six Siege was the toast of E3 – and the single family home map on show has become so familiar in subsequent streams that some of us could probably find our way downstairs to the fridge for a snack in the middle of the night. But that’s okay. Ubisoft Montreal’s maps will have to offer enough variety in approach to withstand not several playthroughs, but several hundred. And this one’s doing just fine so far. This extended footage is sourced from the same Ubisoft-organised Rainbow Six Siege stream we saw the week before last. Where Ubi’s carefully-curated E3 demo sounded like a radio drama played out over VOIP, the two teams here are refreshingly real. Even without the roleplay, though, it’s clear a high level of communication is necessary to carry a team through a round. This is not a game you’ll be playing without a headset. In the minute’s grace period at the start of each round, Team Rainbow are scouting the Boston Suburbs map, scoping out defences and looking in likely corners for the hostage. Meanwhile, the terrorists are engaged in hurried DIY – nailing shutters firmly shut, spiralling barbed wire across the landing and reinforcing flimsy, bullet-susceptible walls. After that, there tends to be a bit of rappelling, and then a good deal of cat-and-mouse. Note in particular that team deaths are visible on the HUD, breeding panic among both sides. Ubisoft scrapped Rainbow Six: Patriots to do multiplayer properly. They made the right decision, didn’t they?